The world is warming rapidly, and the Arctic is warming much more rapidly than the rest of the world. In December 2016, the temperature anomaly from latitude 83°N to the North Pole was 8 times as high as the global anomaly. 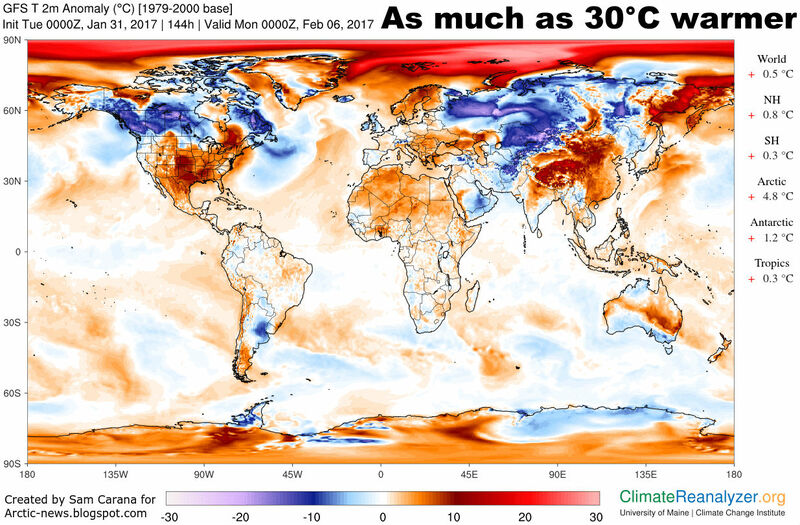 Above forecast for February 6, 2017, shows that temperatures over parts of the Arctic Ocean will be as much as 30°C or 54°F higher than they were in 1979-2000. How can it be so much warmer in a place where, at this time of year, little or no sunlight is shining? 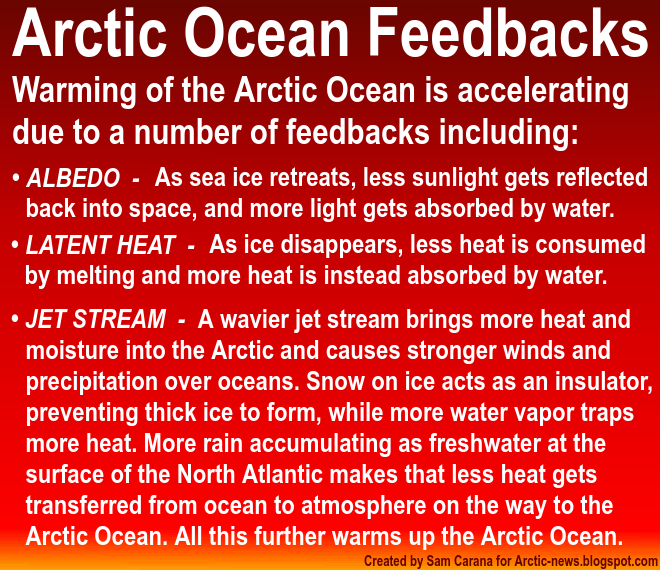 The Arctic Ocean is warming particularly rapidly due to a multitude of feedbacks, some of which are illustrated on the image below. 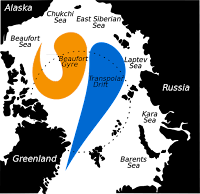 As the Arctic is warming more rapidly than the rest of the world, the temperature difference between the Arctic and the northern latitudes decreases, which makes the jet stream wavier. Jennifer Francis has written extensively about jet stream changes as a result of rapid warming in the Arctic. In the video below, Peter Sinclair interviews Jennifer Francis on these changes. The changes to the jet stream make it easier for warm air from the south to enter the Arctic and for cold air to move out of the Arctic deep down into North America and Eurasia. 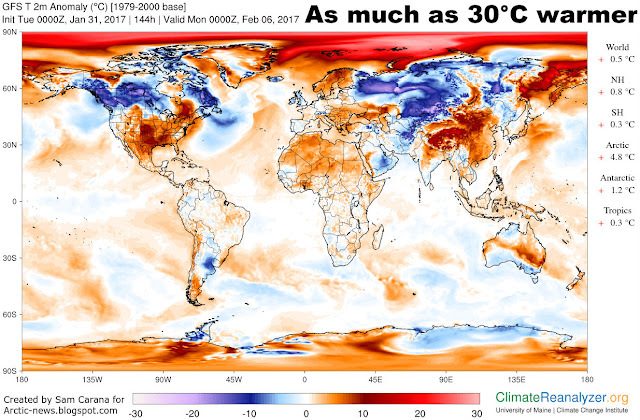 At the same time, this also increases the temperature difference between the continents and the oceans, which is quite significant given the rapid warming of oceans across the globe. The result of the greater temperature difference between oceans and continents is that stronger winds are now flowing over the oceans along the jet stream tracks. Stronger winds come with more evaporation and rain, which accumulates as freshwater at the surface of the North Atlantic and the North Pacific. The freshwater acts as a seal, as a lid on the ocean, making that less heat gets transferred from underneath the freshwater lid to the atmosphere. This makes that more heat can travel underneath the sea surface through the North Atlantic and reach the Arctic Ocean. On January 28, 2017, sea surface temperature anomalies as high as 18.4°C (or 33.1°F) were showing up off the coast of Japan. 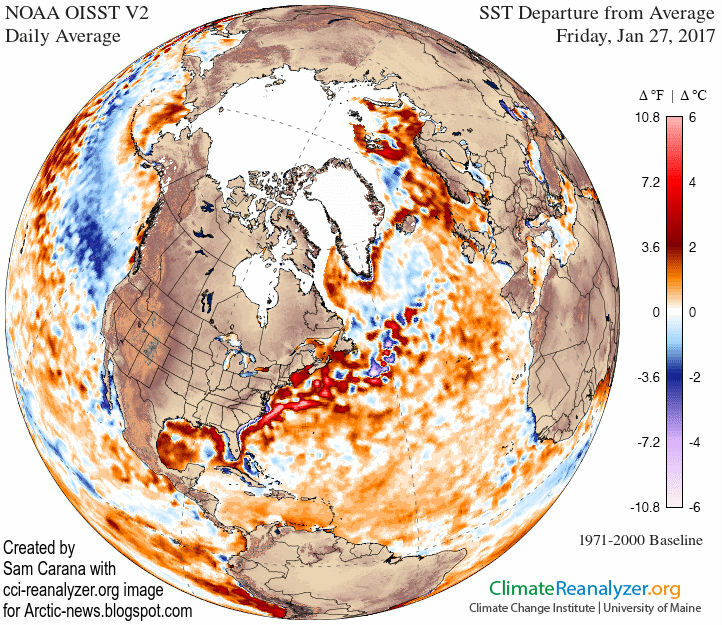 The situation is illustrated by above images, showing areas over the North Atlantic and the North Pacific (blue) where the sea surface was colder than it was in 1981-2011. Over these colder areas, winds are stronger due to the changes to the jet stream. On January 28, 2017, temperature anomalies were as high as 18.4°C (or 33.1°F) off the coast of Japan, while temperature anomalies were as high as 10.9°C (or 19.5°F) near Svalbard in the Arctic on January 27, 2017. The image on the right shows sea surface temperature anomalies from 1971-2000. The video below shows precipitation over the Arctic, run on January 27, 2017, and valid up to February 4, 2017. Changes to wind patterns can also affect sea currents in the Arctic Ocean such as the Beaufort Gyre and the Transpolar Drift. In the video below, at around 7:00, Paul Beckwith warns that further loss of sea ice will make these sea currents change direction, which in turn will draw more warm seawater from the North Atlantic into the Arctic Ocean. As more ocean heat enters the Arctic Ocean and as sea ice retreats, more heat and water vapor will rise from the Arctic Ocean into the atmosphere over the Arctic. Increased water vapor will make it harder for heat to escape into space, i.e. more heat will remain trapped in the atmosphere and this will add to global warming. 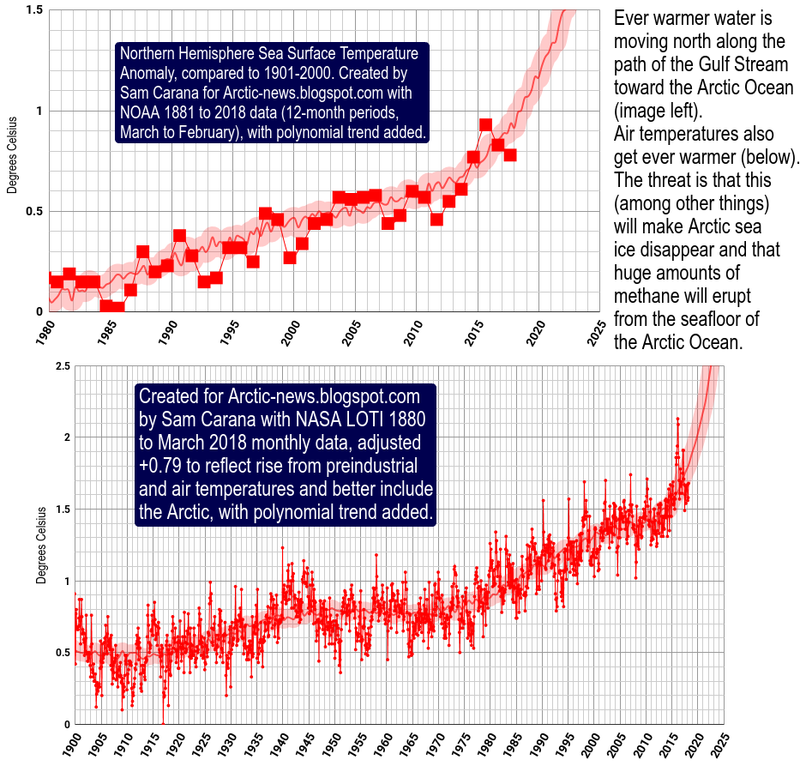 The changes to the jet stream and the associated changes discussed above all lead to further warming of the Arctic Ocean, next to the warming caused by other feedbacks such as loss of albedo and loss of ice as a heat buffer. 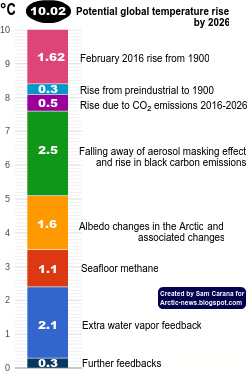 Together, sea ice loss and these associated feedbacks could cause global temperatures to rise by 1.6°C by 2026. 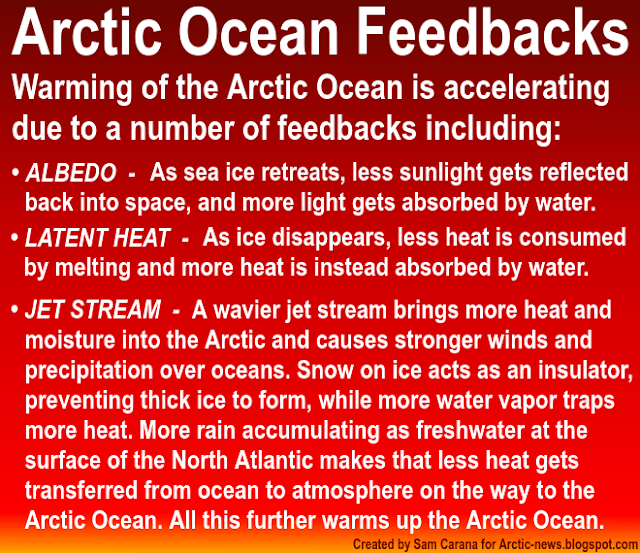 There are further feedbacks affecting the Arctic, as described at this page. One of the most dangerous feedbacks is methane escaping from the seafloor of the Arctic Ocean. As the temperature of the Arctic Ocean keeps rising, it seems inevitable that more and more methane will rise from its seafloor and enter the atmosphere, at first strongly warming up the atmosphere over the Arctic Ocean itself - thus causing further methane eruptions - and eventually warming up the atmosphere across the globe. Above image paints a dire warning. 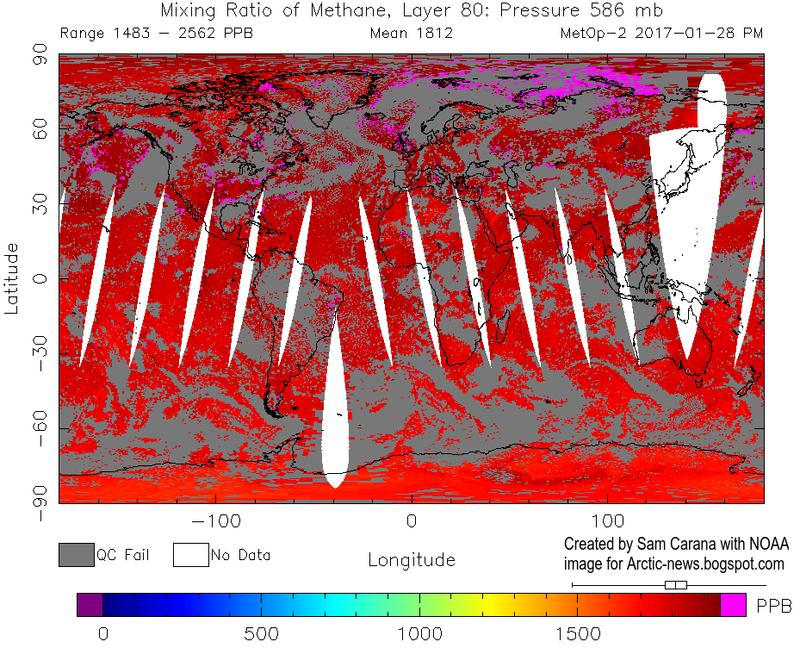 The image shows that methane levels were as high as 2562 ppb on January 28, 2017. The image further shows high methane levels off the coast of Siberia and also where water from Nares Strait enters Baffin Bay. Feedbacks and further elements of a potential temperature rise by 2026 of more than 10°C above prehistoric levels are further described at the extinction page. Can the world be saved without geoengineering?